Made by hand, tuned to the notes of one of the world's most famous classical melodies. Handcrafted, hand-tuned. Aluminum and ash wood. Silver anodized aluminum tubes and black aluminum rods. Ash wood has a rich black finish. Recalls the soft, repeating melody of Pachelbel's celebrated Canon in D. Wood paddle (wind catcher) is engraved with the notes of the Canon: D, F#, G, A, B, D. 5" diameter, 32" long. Ready to hang indoors or out. A perfect wedding gift. 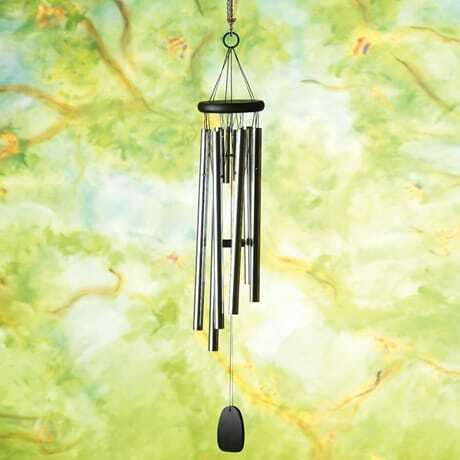 From Woodstock Chimes, makers of the world's favorite wind chimes. Johann Pachelbel's Canon in D is one of the best-known, most often recorded works of classical music ever written. It's said that Pachelbel, a German Baroque composer, wrote it as a wedding gift for Johann Christopher Bach, older brother of Johann Sebastian Bach, in 1694. Like many classical works written long ago, the Canon was forgotten for centuries and rediscovered in the 20th century. In 1970, a French conductor made a recording that was heard around the world; in 1980, the Canon was used as the theme song for the Oscar -winning film "Ordinary People," which made it even more popular. It has been recorded hundreds of time. Today it is most often heard at weddings, where its slow, measured melody, repeated 28 times, is ideal for a graceful processional. We also hear its harmonies and bass line in advertisements and pop songs. Serene, soothing, and majestic, the Canon is now part of our culture. Pachelbel wrote more than 500 pieces over his lifetime, but this is the one most people know. Its notes are instantly recognizable, even when played in random order by the wind.